And you thought 900 year old Jedi Masters abstained from drinking! 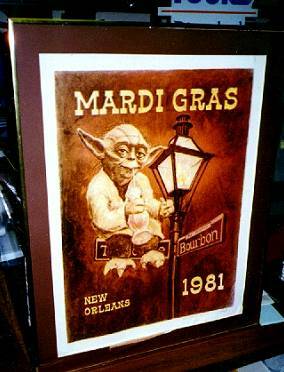 This surely-unlicensed poster was issued at Mardi Gras in 1981. Though I'm not sure what the connection is, it seems that Star Wars has been the subject of a number of Mardi Gras bootleg collectibles, including a rather nifty POTF-like coin. In light of the fiasco surrounding Topps' infamous "Yoda card," I'm sure Lucasfilm wouldn't have looked kindly on such a depiction of the little Jedi; but a big part of what makes this bootleg stuff fun is the weirdness surrounding it.